and is suitable for children aged from five and a half to seventeen years. The SON-R 5.5-17 replaces the SSON 7-17 as well as the 1958 edition of the SON. Its authors are J.Th. Snijders, P.J. Tellegen and J.A. Laros. 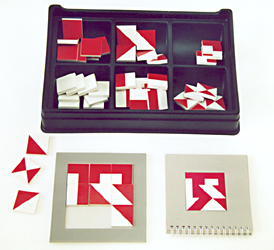 The test consists of seven subtests: Categories, Analogies, Situations, Stories, Mosaics, Patterns, and Hidden Pictures. The first three are multiple choice tests, the other four are action tests. In action tests the solution has to be sought in an active manner, which makes observation of behavior possible. and perceptual tests (Hidden Pictures). An important difference from the previous SON tests is that the SON-R 5.5-17 does not include memory tests. . In the Manual the nonverbal instructions and the verbal instructions are printed next to each other. Both instructions are as equivalent as possible. The most important points of the instruction are printed on the scoring form as an aid to the examiner. In the first place, an adaptive test procedure is used which reduces the amount of items to be presented by about one half. In the second place, following each item the subject is told whether the solution was correct or incorrect. It takes about 90 minutes to administer the SON-R 5.5-17. It is also possible to use a shortened version, consisting of four subtests, which takes approximately 45 minutes. The standardization was performed using a nation-wide representative sample of 1350 Dutch children from 6 to 14 years old. The expansion of the norms to 5.5-17 has been achieved through extrapolation. Norm tables (for 38 age groups) make it possible to draw comparisons at the subtest level. The total test result is represented as an IQ score (with probability interval), as a percentile score, and as a reference age. In addition to the hearing subjects, 768 deaf children were examined by the test. The standardization for the deaf has been limited to the conversion of the total score into a percentile score for the deaf population. The average reliability of the subtests is .76. The reliability for the total score on the test is .93. In the case of deaf subjects the scores on the SON-R 5.5-17 show a correlation of .76 with the scores obtained on previous versions of the SON administered more than three years earlier. The validity of the SON-R 5.5-17 is evident from the clear relationship with different indicators of school career, such as school type, class repetition, and school report marks (R=.59). The correlation with exams given at the end of primary school is .66. In addition to these outcomes, the manual extensively discusses the performance of deaf children, the performance of immigrant children, and the relationship of test scores to socio-economic variables. 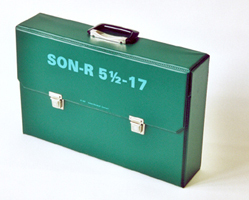 The Complete Set of the SON-R 5.5-17 contains the Test materials of 5 subtests and the computer program, all packed in a sturdy case. The Manual, the subtests Pictures and Patterns, and the Scoring forms have to be ordered separately. The SON-R 5.5-17 Manual and Research Report (1989) is available in Dutch, English and German. From 1 October 2003 the Manual is published by Hogrefe-Verlag, at Göttingen, Germany. In the thesis Construction and Validation of the SON-R 5.5-17, the Snijders-Oomen Nonverbal Intelligence Test, the authors, Jaap Laros and Peter Tellegen, provide elaborate information about the SON-R 5.5-17. The thesis is partly a reprint of the manual and also provides specific information on the process of construction and the theoretical and statistical backgrounds of certain psychometric procedures. However, this thesis does not include the norm tables and complete instructions of the manual. A reprint of the thesis can be obtained from the author, Dr. P.J. Tellegen (or see, on this site, The Construction and Validation of a Nonverbal Test of Intelligence).